Remembering the Battle of the Somme Jump to media player Vigils have been held overnight in France and across the UK to mark the 100th anniversary of the start of the Battle of the Somme. What was the Battle of the Somme? Jump to media player This Friday marks the 100th anniversary of one of the deadliest battles in World War One. Martin has been in France to find out what happened in the Battle of the Somme. Remembering the fallen of the Somme Jump to media player Events are taking place on the centenary of the Battle of the Somme to remember the fallen. Somme battlefields from the air Jump to media player A century after the Battle of the Somme, see some of the key landmarks, battlefields and memorials from the air. Somme soldiers remembered in walkway Jump to media player Thousands of fallen soldiers from the Battle of the Somme are honoured in a new walkway of ceramic tiles in Manchester. Battle of the Somme centenary Jump to media player Allan Little looks at the enduring significance of the Battle of the Somme fought between 1 July and 18 November 1916. The British army suffered its bloodiest day on the first day of the Battle of the Somme exactly 100 years ago. More than 1,000,000 servicemen were killed or injured on all sides as the British and French armies fought the Germans between 1 July and 18 November 1916. 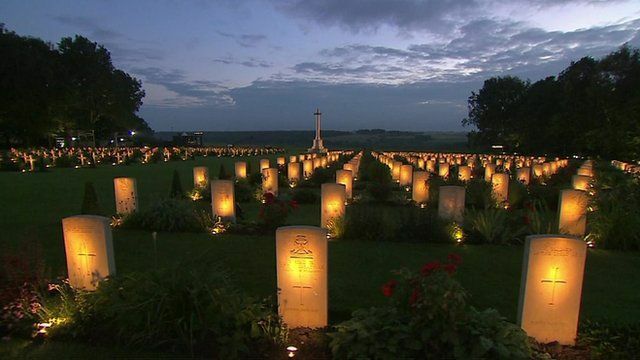 Commemorations have been taking place in Britain and in France to mark the 100th anniversary of a battle which for generations, has symbolised the senseless slaughter of the Great War. Go to next video: What was the Battle of the Somme?